The clacking of knitting needles continues! I made my nephew and his wife a soft, cuddly blanket for their baby-to-be. They are expecting a little girl, it is exciting for the family and their son will enjoy being a big brother! 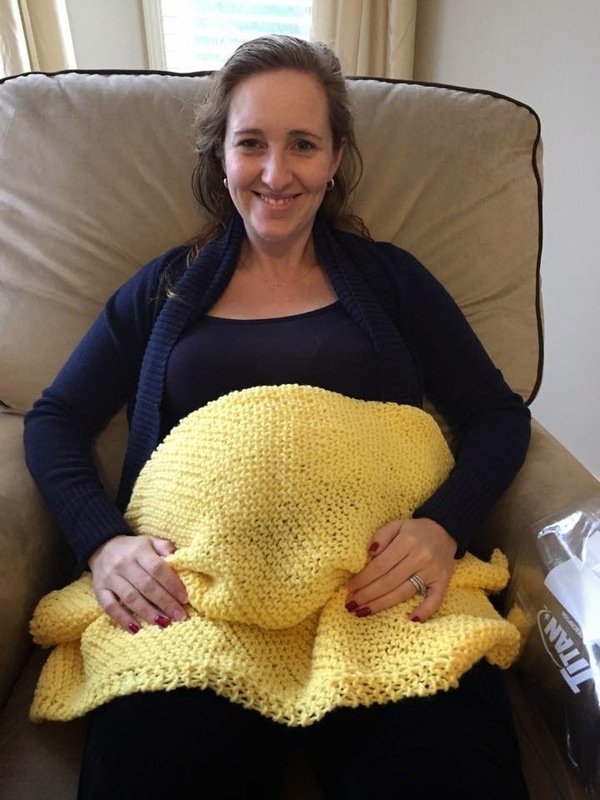 Here is the blanket keeping the baby toasty warm now...she is due to make her arrival at the beginning of December. and be fashionable at the same time! This double loop infinity features one strand of purple and one of cream. It is also destined to be toasty warm. and am also on Pinterest! I have been having a great time with chalk paint. While I have made my own batches with plaster of paris in the past, I am now using brand name paint to see which ones I like the best. For these projects I have been using Deco Americana Chalky Finish paint and creamy wax. My second bucket...base coated with yellow chalk paint, top coated with green and then sanded a bit off of it. I put a couple of coats of wax on it for protection. I lacquered the label of this coffee jar to make it water resistant. There is a hole in the top - I inserted a pump into it. Voila - soap dispenser for the kitchen! Set of two canning jars....for decorative purposes....chalk painted a light blue then sanded a bit to distress them. Wax top coat for protection. Not to be immersed in water. Set of two canning jars...painted a pinkish color in chalk paint, sanded to distress; followed with some ivory chalk paint dry brushed on and then waxed. Raffia ties accent the jars. Not to be immersed in water. These are for decorative purposes only. Large canning jar...painted with blue chalk paint and lightly distressed. Top coated with wax and accented with raffia. Not to be immersed in water. This is for decorative purposes only. Vintage loaf pan painted with blue chalk paint. Coordinates with large jar and also the small blue jars. Top coated with wax. Not to be immersed in water. This is for decorative purposes only. I will continue to share more projects soon! and I am also on Pinterest! I continue to work on projects, some of them can't be posted on-line until after Christmas as they are gifts...it's that time of year to get your gift list together. So here are is just a small sample of what I have been doing! 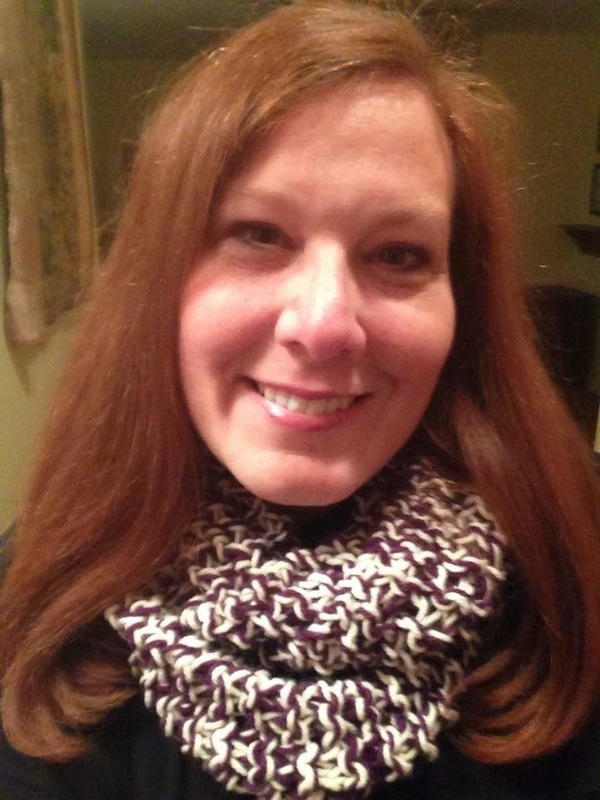 This scarf is made using double strands of multi-colored yarn in green, blue and white. It is about 58" long and I finished it off with fringe. These two canvas signs are for brothers-in-law for Christmas. Acrylic paint on canvas board, sanded back the paint a bit to make it look a bit rougher. Top coated with varnish. I drilled holes and inserted wire to hang. I found a couple of wooden buckets at a thrift store and painted them with Deco Americana paint, sanded the paint back a bit and then waxed it with the cream wax. Raffia on the handle tops it off. A marriage keepsake canvas board....black acrylic paint, lettered with gray Krylon enamel. I floated gray around the edges. Not shown in this photo - I drilled holes and inserted black ribbon for hanging. General Finishes products that I will try out on a large piece. 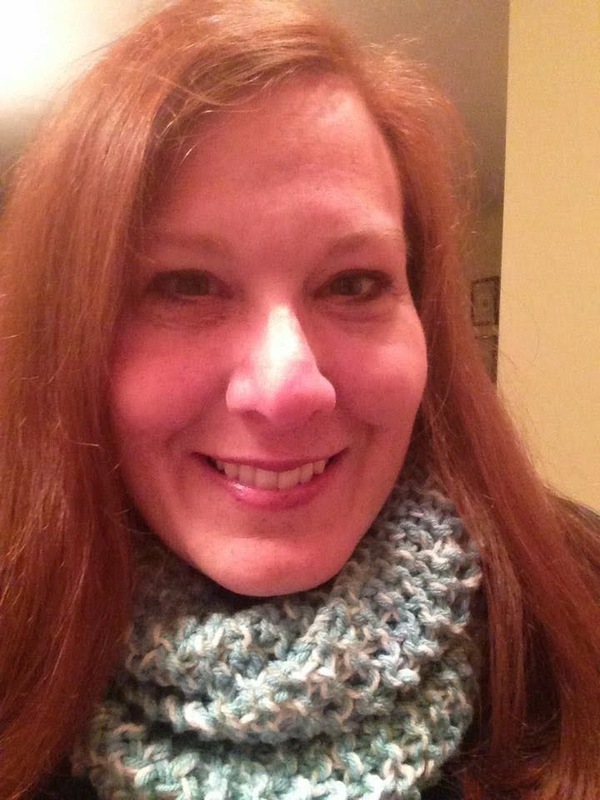 You can also visit me on Pinterest and see all the fun pins! I've been busy with more projects so take a look! In previous blog posts I have shown pictures of chalk painted tables and a bookcase. I also posted the re-do of the old settee that has a new life. These are my latest projects and I am in the process of working on some wooden buckets now and will finish those in the next few days. Come back soon to take a peek! This night table started out with a shiny lacquer-type finish. 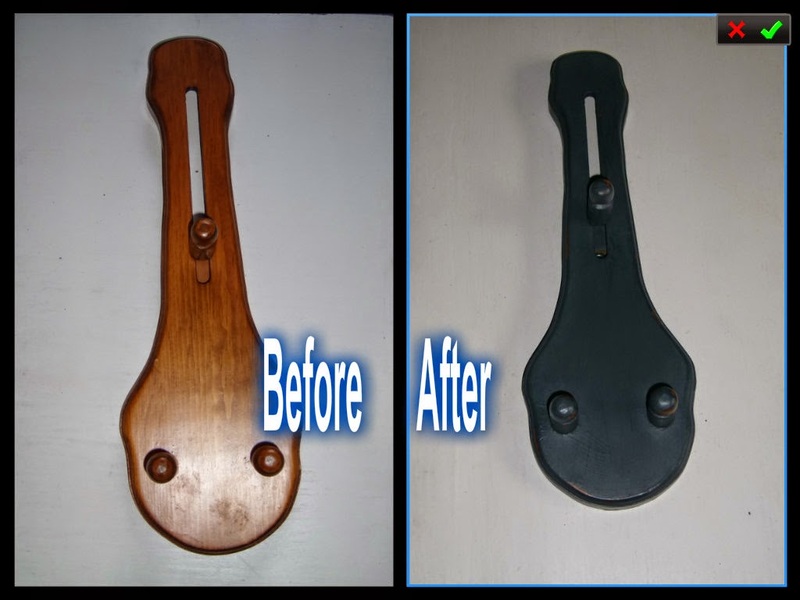 To transform this, I mixed up my own batch of chalk paint using some latex semi-gloss paint (that I used in my kitchen.) This taupe color already made a big difference. 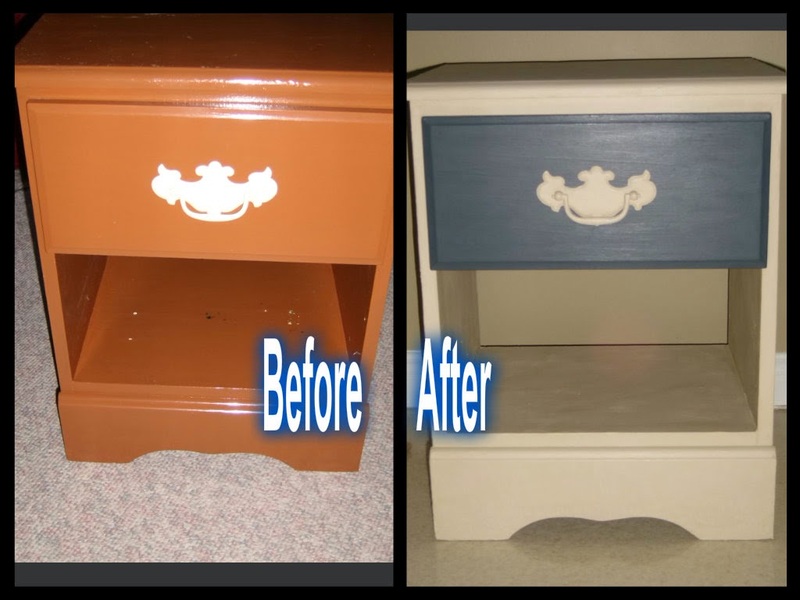 For the drawer I used Deco Americana Relic chalky paint. Since I have seen others use chalk paint for metal handles, I tried that, too. Using the same taupe, it covered well. 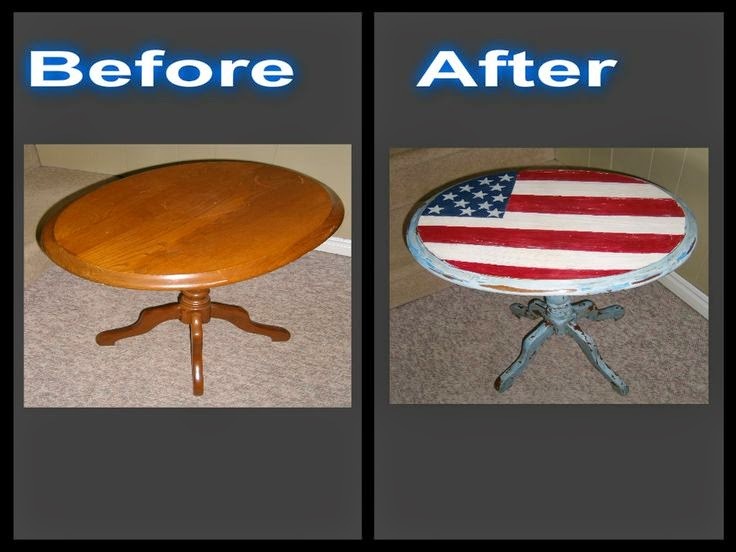 To complete the transformation I waxed the whole piece using the Americana creme wax. Project number two this week started out as a mystery piece. This wooden 'thing' has a spring loaded sliding wood piece. A few of us could not figure out what it was. My hubby to the rescue- he figured out it would hold a decorator plate! This is the completed piece with an Americana themed plate. I painted the wooden piece with Americana Relic chalky paint. Once it dried, I sanded back a bit to distress it. I sealed it with the Americana creme wax. This is one of my fun projects. I made some chalk paint with plaster of Paris. I painted the whole table the light blue. I then came back with red, white and blue to make the flag. Stencilled stars complete the look. From there I went a bit rough with the sandpaper to give it a chippy look. It's for my Americana themed family room. This vanity started out white but lacked personality. 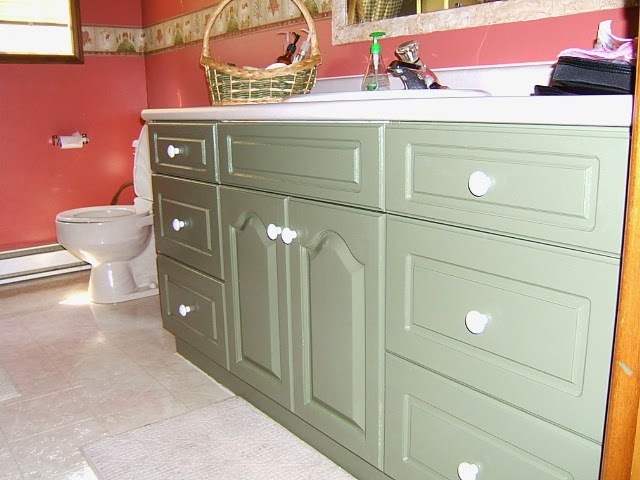 I removed all the knobs and doors and painted the vanity with BeautiTone Exterior paint from Home Hardware. No other top coat used, this exterior paint holds up well in the bathroom. That's about it for now, thanks for looking! I am getting excited to do more projects, will be painting up a storm and also continuing with my knitting. Christmas will soon be here! I can also be found on Pinterest!